The Chastity Belt isn’t consistently funny but did have a few amusing moments, though it did get a few extra points just for the cover which I still continue to chuckle at. The Boston Strangler is a well done, if not methodical, crime-suspense-drama featuring a plethora of fine performances from the likes of Henry Fonda and George Kennedy, but the standout is Tony Curtis playing against type as the murderous Albert DeSalvo. 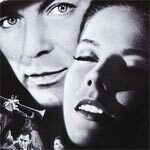 Kings Go Forth is a well intentioned but ultimately ineffective war-romance-drama though the three leads – Sinatra, Curtis and Wood – all turn in fine performances. The Blu-ray released by Twilight Time offers good video and audio transfers but disappoints in the features department.